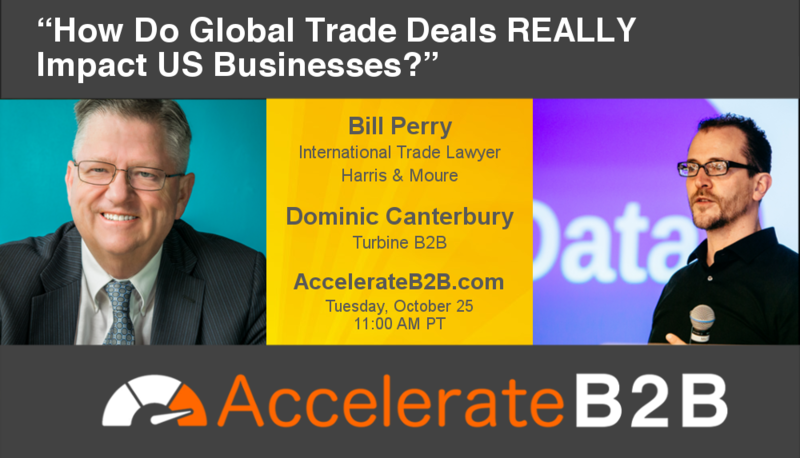 AccelerateB2B: 1 Guest Expert. 1 Big B2B Question. 10 Minutes. With all the heated debate over global trade, it can be tough to get a clear and useful picture of what’s really going on. No matter how you slice it though, one thing is certain: global trade is a powerful force, with huge and often hidden impacts on US businesses. In this episode, we’re talking with Bill Perry, International Trade Attorney with Harris & Moure, about global trade trends, deals, and disputes, and how you can ensure your company is protected and prepared. To read about these issues, please see my blog, US China Trade War. To read the latest on the TPP and also antidumping issues, see my present blog post. Also see this post on Importers Liability for Antidumping and Countervailing Duties. For Trade Adjustment Assistance for Companies, see this blog post. Also to see how TAA for Companies works, see this link, from the Midatlantic Trade Adjustment Assistance Center for a 10 minute video on how four companies were saved by the TAA program. One company was almost killed by imports from China and now is exporting to China. For companies in the Northwest interested in the TAA program, they should contact the Northwest Trade Adjustment Assistance Center. Finally, my firm’s other expertise is to help US and foreign companies going into China to buy and import products, set up manufacturing operations, and export to that country. Dan Harris, who heads Harris Moure, has a very famous blog on doing business in China, which has over 10,000 followers. And if you have any questions, you can contact Bill directly.